Nobel laureate Elias Canetti wrote his novel Auto-da-Fe (Die Blendung) when he and the twentieth century were still quite young. Rooted in the cultural crises of the Weimar period, Auto-da-Fe first received critical acclaim abroad--in England, France, and the United States--where it continues to fascinate readers of subsequent generations. Critical reactions have abounded, but never has a comprehensive study placed this work in its cultural and philosophical contexts. 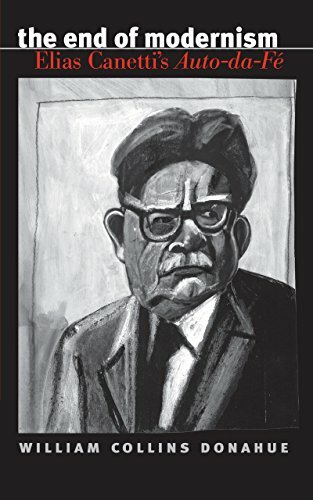 The End of Modernism seeks to do just that, situating the novel not only in relation to Canetti's considerable body of social thought, but also within larger debates on Freud and Freudianism, misogyny and modernism's "fragmented subject," racial anti-Semitism and the failure of humanism, contemporary philosophy and philosophical fads, and traditionalist notions of literature and escapist conceptions of history. The End of Modernism portrays Auto-da-Fe as an exemplum of "analytic modernism," and in this sense a crucial endpoint in the progression of postwar conceptions of literary modernism.